Napa Valley Coffee Roasting Company featuring our freshly roasted coffee in small batches. Check out our delicious espresso and non-coffee drinks prepared by our professional baristas. Espresso- A perfectly pulled shot of dense dark espresso featuring the star of the espresso: a sweet crema. Macchiato- An espresso with a touch of foam. Despite Starbucks' popularization of the term Macchiato, this is a very simple drink devoid of the flavored caramel and size. Cappuccino- Shot of espresso and half steamed milk with half foam. Try a dry cappuccino consisting of a shot of espresso and foam only to act as a filter to the espresso. Cubano- Espresso combined with a cinnamon/sugar mixture and a splash of half and half. Served "shot-style" warm. Americano- Espresso with hot water. Two shots are recommended. 911- Espresso with our freshly brewed coffee. Also know as a shot in the dark. For decaf option, it is a false alarm. Latte- Espresso with steamed milk and topped with foam. Doug's Double Shot (DDS)- Two short shots of espresso, steamed milk and foam. A chocolate swirl tops this eight-ounce drink. Breve- Espresso with steamed half and half. Mocha- Espresso with steamed milk and Ghirardelli ground cocoa topped with whipped cream. Cinnamon- Our Latte with cinnamon and sugar. Chai Latte- A sweet and spicy blend of black tea, honey, vanilla bean and spices with a shot of espresso. Shakerato- Two short shots of espresso, raw sugar and cream. All combined, shaken and served martini style. White Chocolate Mocha- Espresso with steamed milk and Guittard white chocolate topped with whipped cream. Mudslide- Our Mocha flavored with caramel topped with whipped cream. Fantasia- Our Mocha flavored with almond topped with whipped cream. Snuggler- Our Mocha flavored with peppermint topped with whipped cream. customize any of our drinks with torani Syrup! Assorted Mighty Leaf Tea- Orange Dolce, Green Tea Tropical, Earl Grey, Breakfast Americana, Mint Melange, Chamomile Citrus, Green Tea Hojicha, Spring Jasmine and African Nectar. Chai Tea- A sweet and spicy blend of black tea, honey, vanilla bean and spices. Au Lait- A cup of our freshly roasted and brewed coffee with steamed milk and frothy foam. Steamer- Select your favorite Torani flavor and we infuse that flavor with steamed milk topped with foam. Hot Chocolate- Steamed milk and Ghirardelli ground cocoa topped with whipped cream. Cider- A fall favorite, cinnamon/sugar mixture steamed with apple juice creating the perfect cider. White Hot Chocolate- Steamed milk and Guittard white chocolate topped with whipped cream. Mango Iced Tea- Black tea lightly infused with mango. Mint Iced Tea- Green tea infused with peppermint. Italian Soda- Flavor of your choice with sparkling water. French Soda- A twist on the Italian soda, with a splash of cream. Freshly Squeezed Lemonade- House made refreshing lemonade. Arnold Palmer- Half lemonade and half black iced tea. White Chocolate Frappe- Freshly brewed double short shots of espresso, Guittard white chocolate, cream and ice blended and topped with whipped cream. Mocha Frappe- Freshly brewed double short shots of espresso, Hershey's dark chocolate, cream and ice blended and topped with whipped cream. Caramel Frappe- Freshly brewed double short shots of espresso, Torani caramel sauce, cream and ice blended and topped with whipped cream. Chai Frappe- Freshly brewed double short shots of espresso, sweet chai concentrate, Guittard white chocolate and ice blended and topped with whipped cream. Slushie- Flavor of your choice, sparkling water and ice creating a custom slushie. Daily Selection of Freshly Baked Pastries and Donuts from ButterCream Bakery- a Napa Valley favorite since 1948! 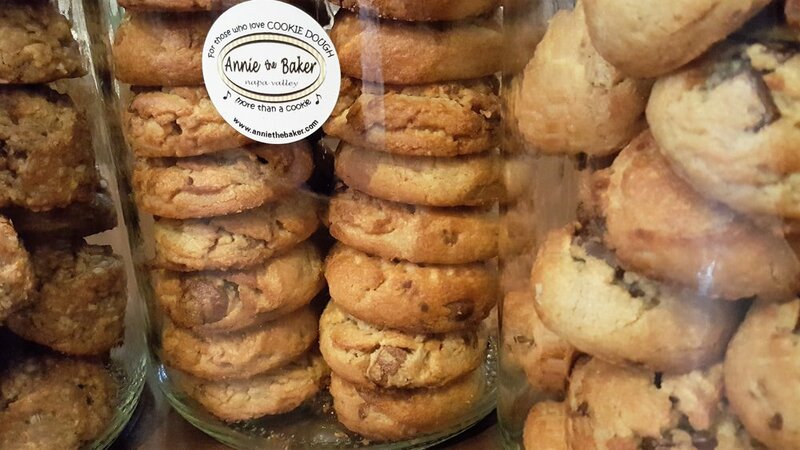 Now offering Annie the Baker cookies; these might be the most AMAZING cookies you have ever eaten!